Getting train tickets is always very difficult during holiday, especially in Spring Festival, the most important Chinese holiday for family reunions. The transport peak spans from Jan. 26, 2013 to March 6. 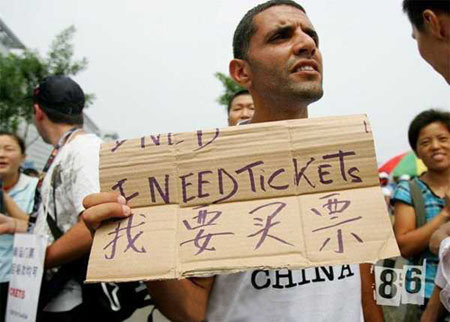 During this period, buying tickets at railway station or from the official website of MOR (China’s Ministry of Railways) or through phones seem to become an extravagant expectation. What are the reasons? How to take effective measures? Although MOR has taken various measures to ease the ticket purchasing rush, such as increasing more trains temporarily, extending the presale period and prohibiting the usage of ticket purchasing plug-ins, etc. But the effect is not so impressive. The reason is that these measures are not based on thorough analysis. According to the data of Chendu Railway Station on 18th, February, 2013, though 14 temporary trains have been added, tickets of many trains still have been sold out. This indicates that only increasing the number of trains is not enough. Therefore, in order to find out the reasons and take effective measures, detailed statistical computing and analyzing are needed. Data from MOR shows that a large number of tickets are refunded just a few minutes before the trains leave the station. In this case, there are quite a few vacant seats on the train but too late to be sold. So, inadequate supply is not the only factor that causing the difficulty of getting tickets. Through computing and analyzing with easy to use desktop BI software like esProc and esCalc, it’s not hard to discover the cause of this phenomenon. That’s because quite a few people buy more than one tickets but don’t return the extra ones until the deadline. In this case, besides the shortage of tickets, other factors including people’s buying habit should also be considered before making decisions. In addition, the channels and ways that people purchasing tickets change from time to time. They will try new ways to secure their tickets purchasing if current ways are not working. That’s to say, previous good measures may not be suitable for current situation and real-time analysis to the ever-changing tickets data is necessary. Desktop BI tools like esProc and esCalc are ideal choices since they don’t need modeling beforehand and simplify complex computing with step by step computing mode. It’s undeniable that MOR’s measures play a part in some extent. But problems haven’t been fundamentally solved. Effective measures are based on thorough and real-time statistical computing and analysis.